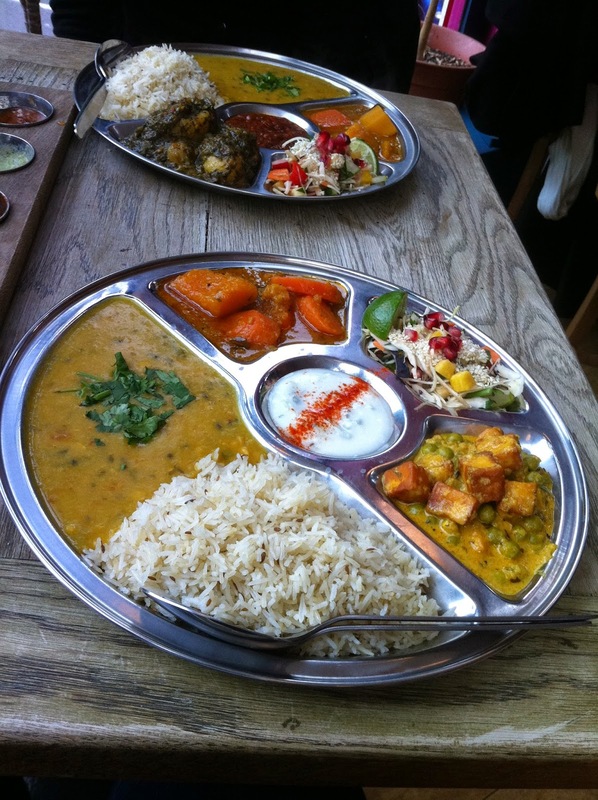 I went for a Thali recently in the wonderful, Montpelier Thali Café. Those of you from Bristol will already know that these are delicious curries served in bright Indian cafés around the city. Having started out as stalls at festivals around 15 years ago the cafés have now become a bit of a Bristol institution. There are five cafés in total in Bristol and each is unique with quirky, colourful and kitschy décor, they are festooned in fairy lights, cushions and throws and have a cosy, ‘Indian’ feel. Although they do serve individual dishes, the Thali itself is their speciality and is authentic, healthy street food made up of a selection of various dishes placed on a round tray with multiple compartments. Although the choices are excellent, the menu is short and sweet – just what I like. Although it sounds great having a large choice in a restaurant, in reality I like having my options limited. I reason that they are probably all delicious so there’s really little point in spending hours deciding! The restaurant has a strong focus on vegetarian and dairy-free food. Being a committed carnivore it’s usually difficult for me to get excited about most vegetarian food but this is different and though there are plenty of meat and fish options I chose the vegetarian Northern Thali. This consisted of paneer - cubes of Indian cheese fried until golden and served with peas in a creamy and subtly spiced sauce, a wonderful, dark and spicy dahl, a vegetable curry, a rice and a crunchy, fresh Keralan salad. I enjoyed the dahl the most - spicy, simple but delicious. Knowing how or where to start was tricky…but as the meal was huge and the paneer and the dahl were my favourites, those were what I concentrated on - I didn’t want to get too full on salad or rice! I drunk a delicious mango lassi, a traditional, yogurt-based drink. It tasted sweet but not unhealthily so. I wasn’t feeling too well at the time, I’d just started a nasty cold but the whole meal made me feel as if I was doing my body some good and it was nothing like usual Indian food I’ve eaten in England. My friends had a mixture of dishes including the Southern Thali – a Goan fish curry with similar accompaniments to mine. Almost everyone liked their food, including my 11 year old who chose the Mogul Thali –a sumptuous chicken Thali, slow-cooked with curry leaves, tomato & coconut. I say almost everyone - my friend’s child had the child’s fish and chips (described as ‘Masala fried fish with Bombay potato chips’). Unfortunately, being a conventional boy, he wasn’t impressed - a shame but not hugely surprising. There was however a slightly off putting life sized mannequin that stood behind our table - at one point I nearly asked it a question thinking it was the waitress but I think that was because my cold was starting to make me feel slightly delirious. At the end of the meal I would have loved a desert. I had been fantasising about the kulfi throughout the meal but no one else in our large party ordered one and I simply felt too greedy to be the only one to do so. I came away feeling deliciously full but not stuffed and just ever so slightly virtuous. And great to enjoy a meal with friends that's not too pricy either!